UT Southwestern Medical Center scientists report the first successful blocking of tumor development in a genetic mouse model of an incurable human cancer. "To my knowledge, this is the first time that a mouse model of a genetically defined malignant human cancer has been generated in which the formation of the tumor from beginning to end can be monitored and in which blocking the pathway cures the mouse of the tumor," said Dr. Luis Parada, chair of the department of developmental biology at UT Southwestern and senior author of the study published in Cell and online. The study's first author is Dr. Wei Mo, a postdoctoral researcher in the department. "We showed that blocking the activity of a receptor molecule named CXCR4 in these tumors – through genetic manipulation or by chemical blockade – inhibited tumor development. Together, these data reveal a potential target for therapy of these uncommon but currently untreatable malignant peripheral nerve sheath tumors (MPNSTs)," Dr. Parada added. The study is a collaboration between Dr. Parada's laboratory and that of Dr. Lu Q. Le, co-senior author of the study and assistant professor of dermatology. Dr. Le also is co-director of the adult Comprehensive Neurofibromatosis Clinic at UT Southwestern, the first such clinic in North Texas, which is part of the Simmons Comprehensive Cancer Center. 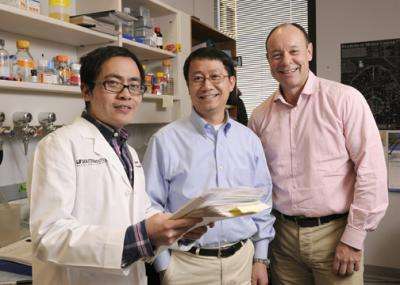 The researchers noted that co-authors at The University of Texas MD Anderson Cancer Center and Baylor College of Medicine, Houston, greatly accelerated the research effort. MPNSTs are rare but highly aggressive tumors that are resistant to therapy and are typically fatal. The malignancies can occur sporadically or in a subset of patients with a condition called neurofibromatosis 1 (NF1) – one of the most commonly inherited disorders of the nervous system, which affects an estimated 1 in 3,500 people. The severity of NF1 can vary widely, even among family members, from mild dermatological symptoms to benign tumors that wrap around nerves and can be disfiguring, debilitating, and even life-threatening, depending on where they form, Dr. Le said. In addition, individuals with an improperly-functioning NF1 gene have an increased risk of developing cancerous tumors such as MPNSTs, he said. The researchers generated a mouse model that spontaneously develops MPNSTs and compared gene expression activity in cancerous tumors and in the precursor cells that give rise to the tumors, which are the kind of cells in which MPNSTs develop. They found that a protein (CXCR4), which is essential for tumor growth, is more abundant in cancerous cells than in precursor cells. In addition, they found that a molecule produced by the cancer cells themselves (CXCL12) works with CXCR4 to further the growth of cancer by stimulating the expression of the cyclin D1 protein, which promotes cell division via a signaling pathway outlined in the study. When they examined human MPNSTs, the scientists found increased expression of CXCR4 accompanied by activity in the same pathway as the one identified in the mice, the researchers said. Next, they blocked the activity of CXCR4 in the MPNST mice using either genetic manipulation or an FDA-approved antagonist drug for CXCR4 called AMD3100. Both strategies inhibited cancer development in mice whose tumors expressed increased levels of CXCR4, and were less effective in tumors without increased CXCR4 expression. They identified the same situation in the human cancer cells, the researchers report. "We are very encouraged by these findings because they provide us with new directions and therapeutic windows to combat this deadly cancer, where none exist today," said Dr. Le, who added that the researchers are currently planning human trials.